Harderian gland - Pigment in a female F344/N rat from a subchronic study. There are golden to dark brown amorphous clumps or laminated concretions of pigment (likely porphyrin) in the acinar lumens (arrow). Harderian gland - Pigment in a female F344/N rat from a subchronic study (higher magnification of Figure 1). This higher magnification image shows the intra-acinar pigment in greater detail. Lipids are the primary secretory products of the rodent Harderian gland, but porphyrin pigment is also synthesized and secreted. Porphyrin pigment occurs as golden to dark brown amorphous clumps or laminated concretions in the alveolar lumens ( Figure 1 and Figure 2 ). Porphyrin secretion increases with age, and excessive production results in "red tears" (chromodacyorrhea). Incidentally occurring porphyrin deposits are generally more prominent in the Harderian glands of female rats and mice. Increased porphyrin secretion can also be a treatment-related effect following administration of various chemical agents. 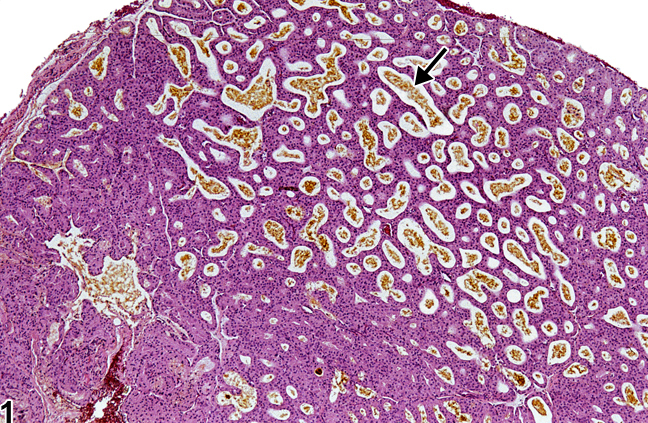 Since porphyrin pigment is a normal finding in rodent Harderian glands, pigment should be diagnosed and assigned a severity grade only if there are treatment-related differences in incidence and/or severity. 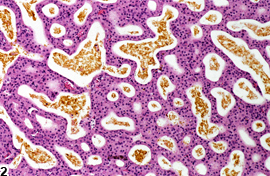 It should also be diagnosed if the pathologists feels the pigment is composed of something other than porphyrin (e.g., hemosiderin or lipofuscin). Definitive pigment identification is often difficult in histologic sections, even with a battery of special stains. Therefore, it is recommended that a diagnosis of pigment (as opposed to diagnosing the type of pigment, e.g., hemosiderin or lipofuscin) is most appropriate. 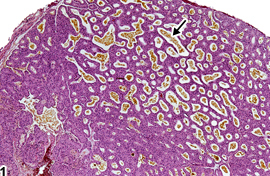 The pathology narrative should describe the morphologic features of the pigmentation. Not all pigments have to be diagnosed, as some are ubiquitous in aging animals or related to some other disease process and not toxicologically meaningful. The pathologist should use his or her judgment in deciding whether or not secondary deposits of pigment are prominent enough to warrant a separate diagnosis. Beaumont SD. 2002. Ocular disorders of pet mice and rats. Vet Clin Exot Anim 5:311-324. Brownscheidle CM, Niewenhuis RJ. 1978. Ultrastructure of the Harderian gland in male albino rats. Anat Rec 190:735-754. Chieffi G, Chieffi Baccani G, Di Matteo L, D’Istria M, Minucci S, Varriale B. 1996. Cell biology of the Harderian gland. Int Rev Cytol 168:1-180. Djeridane Y. 1994. The Harderian gland and its excretory duct in the Wistar rat. A histological and ultrastructural study. J Anat 184:553-566. Iwai H, Tagawa Y, Hayasaka I, Hayasaka I, Yanai T, Masegi T. 2000. Effects of atropine sulfate on rat Harderian glands: Correlation between morphological changes and porphyrin levels. J Toxicol Sci 25:151-159. Payne AP. 1994. The Harderian gland: A tercentennial review. J Anat 185:1-49. Sakai T. 1981. The mammalian Harderian gland: Morphology, biochemistry, function, and phylogeny. Arch Histol Jpn 44:299-333. Seely JC. 1987. The Harderian gland. Lab Anim 16:33-39. Watanabe M. 1980. An autoradiographic, biochemical, and morphological study of the Harderian gland of the mouse. J Morphol 163:349-365. Williams DL. 2002. Ocular disease in rats: A review. Vet Ophthalmol 5:183-192.